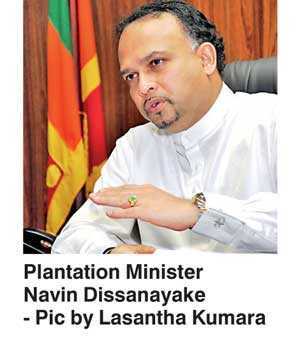 In a bid to face any downturn in the tea sector, Plantation Industries Minister Navin Dissanayake on Tuesday said the setting up of a special fund of Rs. 5 billion within the next three months is under consideration. “I want to have a special fund set up for the tea industry, where it will assist the stakeholders in the replanting process as well as to meet any emergencies. I’m thinking that in about another two to three months we’d be able to set up this fund,” Dissanayake told the Daily FT.
Dissanayake pointed out that this additional fund would be collected and governed by the tea industry. “I don’t want to interfere in any of these. All I want is to set up the mechanism for the industry. If the industry can agree on a particular price, then I can set it up and they can govern it themselves. I think that’s the best way forward,” he added. He said that all stakeholders had agreed that replanting was very poor and it was one of the major drawbacks within the tea industry. “Right now the issue for the future is replanting and 73% of the total tea production is coming from tea smallholders. Although we need 2% of the total replanted per annum, perhaps only 1% is replanted. Therefore it’s important to provide these tea smallholders with a subsidy for the loss of income during the whole process of one and half to two years, when they stop for planting,” he stressed. According to the Minister, to replant 2% of the total land the Government would need at least Rs. 8 billion a year. “When prices are good, nobody even talks about it but when prices are down everybody wants subsidies. This mentality has to be changed,” he stated. He noted that the current tea fund collected over the years from the levies would be phased out within the next one and half years and there was a clear need for an additional fund for replanting and for emergency situations. Dissanayake said that they were looking at several models to set up the fund, but there was no consensus from the industry yet. “I will try and discuss it with them further, failing which I will make a decision in the interest of the industry, which I can do. I cannot be diplomatic all the time,” he stated. He expressed confidence that if the fund could be set up for the benefit of encouraging farmers to replant tea bushes, Sri Lanka’s tea industry would be able to hit at least 500-600 million kilograms of total tea production by next year from the current maximum production of 350 million kilograms.